We have worked on the English Sudoku game for a while now. The game was originally developed for our SuperLearners as they needed some more advanced English games to further develop their English skills. However, we liked the game so much that we decided to release it to all kids in a lighter edition. The Sudoku for the SuperLearners is made for the more advanced English learners. Educational wise, the Sudoku game strengthens the listening, reading and word recognition skills of the students. Normally, Sudoku is about numbers. We use English words. The game is based on the different English words practiced in the Mingoville Missions. Each game of Sudoku uses 6 English words that are repeated throughout the game. Besides practicing the English vocabulary, the kids also practice traditionally Sudoku puzzle skills of logic and combination. The new English Sudoku is not a beginner game. You need to reach a certain English level within Mingoville Virtual World to play the Sudoku. The number of feathers indicates your level. A higher level gives you access to more maps and English games. To play the Sudoku game, you need to have the Mingoville mobile phone. You can get the Mingoville mobile phone when you have 20 feathers. Do you play Sudoku? If not, here are a few guidelines: It’s like a puzzle. 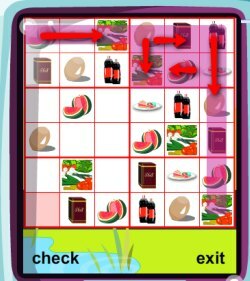 You have to make sure that only 1 example of the word appears in each row, each column and each 2×3 grids inside the game. All cells are to be filled out to finish the game. Use the “check” button to see if the words are correct – if the cellsturn red, you need to choose another word for these cells otherwise the puzzle can’t be solved. To change words and to move between cells, use the arrows and the “select” buttons on the mobile phone. The faster you finish the Sudoku, the more points and coins you gain. This entry was posted in Mingoville and tagged 1. Mingoville Virtual World Games, English for kids, English games, ESL for kids, free english, game-based learning, virtual worlds by . Bookmark the permalink. Excellent content and genuinely helps with becoming familiar with the issue much better.